Grand Orlando Resort at Celebration the newest upscale, independent resort in the Orlando area announces exclusive theme park packages for hotel guests. The offer provides guests the convenience of saving time and money by booking theme park tickets for their families through The Grand Orlando directly via partnerships with destination favorite parks such as, Walt Disney World, SeaWorld, Universal Orlando, and more. Don't miss out! Through the special offer, guests staying at The Grand Orlando will be offered guest-only booking rates with deals ranging, based on the dates selected and the number of theme park tickets booked when using the packages. The packages give families the option to plan ahead and skip the lines with the option to save up to $25 or more per ticket. The Grand Orlando Resort at Celebration is the perfect destination for theme park goers whether visiting Orlando or getting away for the weekend, conveniently located within close-proximity to major Orlando attractions and theme parks, including a short 1.5 mile drive from the heart of the Walt Disney World® Resorts. 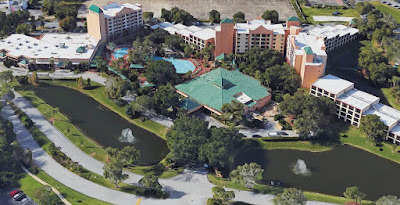 Situated on 20 lushly landscaped acres, the resort is 30 minutes from Orlando International Airport and just off Interstate-4 and Highway 192. "Grand Orlando Resort at Celebration is the place to stay to experience the quintessential Orlando visit," said General Manager Mark Gallagher. "Through our exclusive theme park packages we aim to help guests get the most out of their visit with convenient and affordable theme park deals at beloved parks including family favorites such as Walt Disney World. Our offers will give hotel guests more time to enjoy Orlando and time with their family." The Grand Orlando offers 718 well-appointed rooms and suites, a variety of dining options, and unparalleled service, all with an incredibly convenient central location that makes it the ideal retreat for leisure or business travelers. For more information potential guests can visit grandorlandoresortcelebration.com or call 1.800.634.4774. 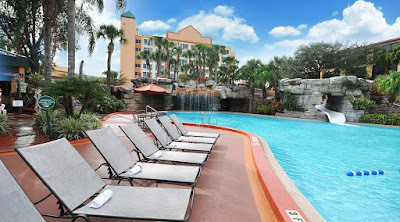 Grand Orlando Resort at Celebration is the ideal location for the quintessential Orlando adventure and vacation destination for families, couples and general travelers. The property is conveniently located in close-proximity to prime Orlando attractions and theme parks, such as Walt Disney World Resorts®. Visitors can expect 20 lushly landscaped acres of scenery, 24-hour front desk service, elite banquet facilities, poolside bar and a range of additional personalized amenities. Fun, engaging experiences, a variety of dining options and neighboring shopping town Celebration, all contribute to what makes the Grand Orlando Resort at Celebration a full service, world-class guest destination.